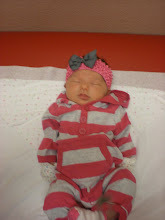 Today my little London is two months old! I honestly don't know where to begin. London you have made our family complete. The joy you bring to my heart everytime you smile or giggle is indescribable. You big sister loves you so very much, she just adores you. Today Brooklyn tried to feed you some of her chocolate chip cookie, but mommy stopped her. She loves to call you her baby. We are trying to break her of that. You are such a great little sleeper, but have a rough patch of the day between 3pm and 6pm. You really just want to "talk" ie cry and be held which mommy has no problem loving on you. Daddy loves to talk to you and make you laugh. You still make him uneasy with your wobbling ways, but he is coming around. We go to the doctor on the 29th for your two month shots and stats. I can't wait to see how much you have grown. London Willow, you bring so much joy and love to our lives. I just can't imagine my life without you. Not so happy London! Even upset she is adorable! 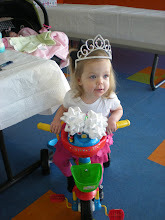 A Party for MY Princess!